The hiring process is one of the most difficult hurdles for any employer to overcome. It can be so easy to just hire at the minimum standard at the start, especially if work is just picking up. Your business, as you know, deserves the best in every capacity. If you’ve ever been in charge of hiring for even just a part-time gig, you know how it goes. Depending on how you source the talent, you maybe have to look through hundreds of identical resumes. Smelling them, wondering if there’s any way you can just close your eyes and you’ll know the right one when you get to it and throw away the rest. But it isn’t that easy, especially at first. You are almost guaranteed to get it wrong. When it comes to hiring, failing can be damaging, even fatal. The good news is that from learning from those mistakes can make you stronger and much more knowledgeable in business and life for the future. I've had the benefit of hiring many new workers for the retreat center I previously worked at. At first, I looked for people who I would enjoy being with. That led me to find people that were really cool and nice, but who didn't have the exact drive I was looking for. Then, I figured I wanted to find people who were going to do the job without complaint. But in that, I found people who were there only for the paycheck and didn’t subscribe to our mission. In each of those scenarios, difficult cuts had to be made. Through many iterations of failure from looking for a single trait, I found that I needed to be very specific, if not impossible, in my search. Look for people with multiple skills and interests. Open minded people tend to understand the big picture. Specific skills can always be refined in-house. Even the most specialized talent will need time to learn your business and how it works, so don't get stuck with someone who only knows a single skill. Always hire one more person than you need in each department. When people come to me that I love or would like to hire, I don't make them wait. Create a position in your company for them. You never know what life will bring for the rest of your team. Emergencies come up and you'll be happy with padding. Hire slowly. It's better to be overworked than to hire the wrong person or to end up in a cashflow pinch. Look for people skills. Emotional intelligence is hard to teach and it defines how employees will deal with you, your team and customers. Don't try to hire superstars. Egos are for professional athletes. In real life, you want humility over someone who thinks they're the GOAT. When you take your list and find they meet a lot of the criteria for the job and your checklist, you can train them and work with them to bring up any of their weaknesses. Now when I say, only hire the best, I’m actually meaning, hire the best for your company. The best doesn’t just entail “give me the person with the highest intelligence” or the best programming skills or so on. It’s the person that meets a broad spectrum of points as you define them. Look for a balanced skill set and you can work to develop certain aspects of themselves later. That’s how we’ve taken great strides at Dubsado with very limited resources and staff compared to the rest of the companies on the market. We are a united team, with a wide array of talents and key traits that allow us to stay on the same page. From social media, over to programmers, over to the support team, we are all able to be a single unit while simultaneously strengthening our specific duties. Less is lost in communication and much is won by not needing rigid and bureaucratic systems to glue everything together. Making a good hire a great one. Once you’ve brought in the right people, it’s important to make sure you set to putting them to the right kind of work. Identifying the unique talent, and traits will allow you not only to employ them in the right roles but utilize them beyond that. It’s so important to remember that while your hires may be brought on to meet immediate and pressing needs, they also have the ability to create more value for your brand if you empower them. If you listen and watch carefully to what motivates them, and allow yourself to take chances. 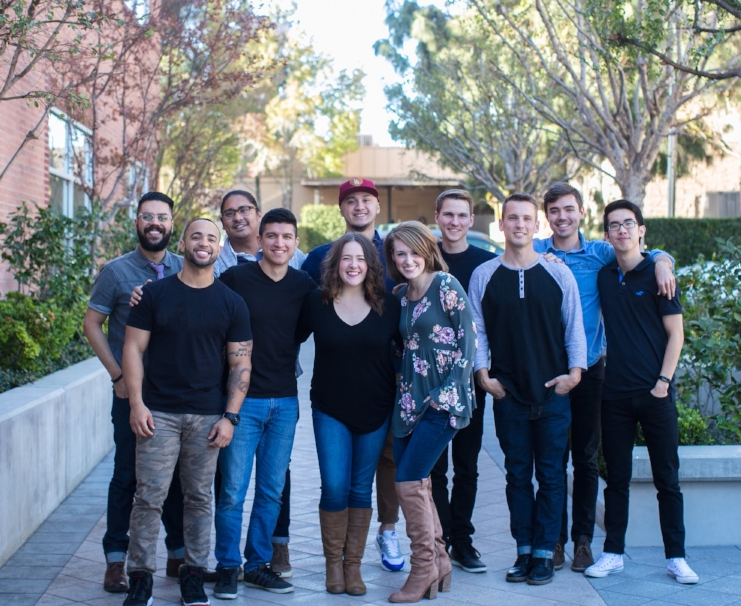 At Dubsado, our hires bring a variety of background, experience, and passion to the office: in event planning, videography and design, relationship building and connecting. Understanding how to identify, nurture and employ those interests not only has the chance to add value to your business but it also increases their loyalty and passion for your work in return. A Dubsado team member with a background in event planning was given the reigns to create and host “The Huddle”, our monthly Dubsado meet up soon to expand to cities around the world. Another was given a platform to use their passion for storytelling and connecting. The result was our podcast, The Creative Leap by Dubsado. A customer service specialist with a background in video work captures and tells our weekly story with our Behind the Scenesseries. These are just a few examples of the ways that being attuned to the desires, skills, and passions of those hires can provide value far beyond their core roles. Dubsado doesn’t need to do any of these things. We GET to because everyone on our team is passionate about empowering creative entrepreneurs in different ways. Through the many mistakes I’ve made, I have learned many great principles of hiring. The first being, hiring for an array of qualities instead of seeing people as a single purpose. Once you have that point of view, filter, and search for specific talent qualities and your success is assured. Then, it’s important to allow those hires the room to grow and breathe in ways that not only energize them but lift everyone up. Empowering them to add value to your business through their unique skills and passions is an amazing way to grow your business! At the end of the day though, if you gather people who believe in what you are doing and turn that belief into passion, you'll have found a second family. What more could you ask for?